AIC is proud to offer theater seating from Fortress, Lane, and Elite. To create a completely finished home theater room, you'll need home theater seating. Depending on your room size, you may have the option for one or more rows of elevated individual seating. On the other hand, create a cozy environment with the style of a love-seat theater chair. Theater seats vary in price and can be fit within nearly every budget. There are many colors and fabrics to choose from. Additionally, there are powered and non-powered foot rests as well. Another neat option is lighted cup holders. iPad docks and end tables are a great way to customize a home theater room, too. Choose from a variety of single arm, double arm, armless chairs, and love seat theater chairs. The options are endless! Once you have selected the best chair that fits your needs, the next thing to consider are risers. Risers allow everyone in the room to gain the best viewing and acoustical experience. Often, they are thought of as an expensive addition to a theater room, which are why they are easily forgotten. When in fact, they aren't as expensive as one might think. AIC is able to meet just about every home theater budget. We have been Bluffton's home theater expert since 2006! Not sure about a home theater design, let AIC help you determine what's the best design for your custom home theater. 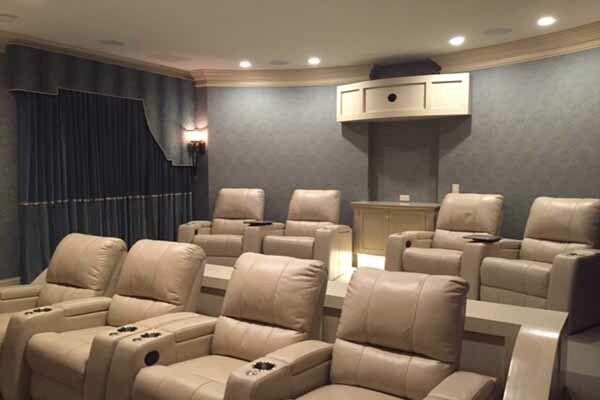 We take pride in designing and installing Home Theater Seating projects in homes and businesses throughout Hilton Head, Bluffton, Palmetto Bluff, Savannah, Beaufort, and surrounding areas. Call us today at (843) 836-5700 to discuss getting your project started!